The Frenzel + Berg CANopen Units of the hipecs series are general purpose CANopen remote I/O Modules with several I/O configurations which includes digital and analog IO’s, PT100/1000 inputs and proportional current outputs. They are especially designed for easily connecting almost all kinds of sensors and actuators to a CANopen-network. There is no necessity of making any program. The hipecs Units have separated power supplies for the system/bus and the I/O’s. All I/O’s are positive switching and opto-isolated from bus and system supply. 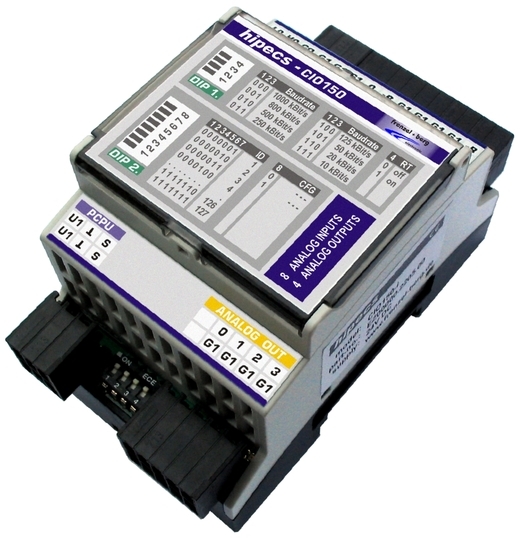 The outputs are short-circuit-protected and output overload monitoring is supported. Different baud rates up to 1 Mbit are possible. All modules are suitable for mounting on DIN carrier rail.